On a recent Ulta shopping trip I came across the Basically U Nail Polish Remover Pads while checking out. They were of course strategically placed in the check out display. I decided to give them a try since they can be handy to have in your makeup bag or purse for any nail emergencies. The box comes with 6 individually packaged nail polish remover pads. 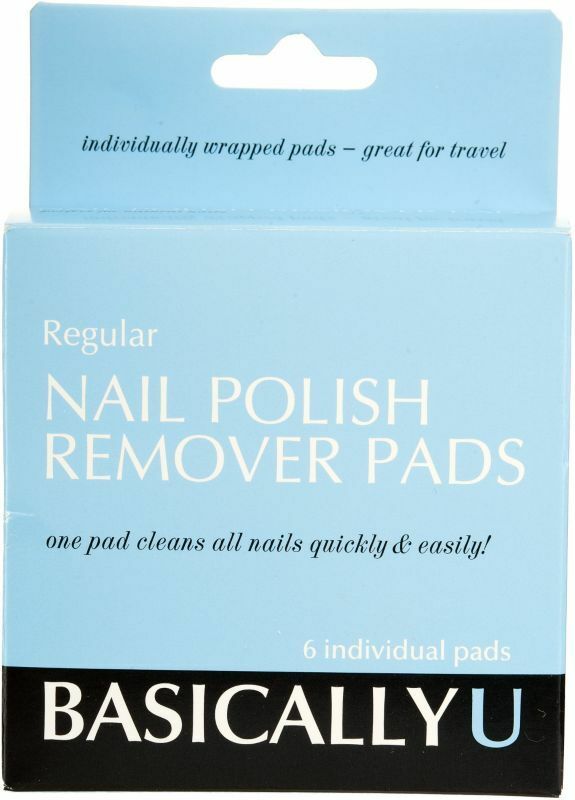 Ulta claims that one pad cleans all nails quickly and easily. This claim is true to a certain extent. The first time I decided to try these I had on glitter nail polish, which tends to be difficult to remove. One pad removed most of the polish on both hands but I did have to work at it and it left some glitter specs here and there. To give them a fair chance, I tried them again when I had on regular polish and the pads did their job and removed the polish. I really like these for the purpose of convenience. I would recommend buying them to keep a few in your makeup bag or purse for nail emergencies or use them for travel purposes. For all other nail polish removing occasions I would stick to good old fashion nail polish remover and cotton balls. If you don't have an Ulta in your area, I would recommend checking your local drug store to find another brand as an alternative. Have you used Ulta's Nail Polish Remover Pads or an alternate brand? Disclaimer: The above thoughts and recommendations are based on my own personal opinion. Results are not guaranteed. The products mentioned above have been purchased by me. This post has not been sponsored. My love for makeup started at a young age. For as long as I can remember makeup has always been around me. I used to get to play with makeup and have it done for dance recitals and pageants. By the time I got to middle school, I was allowed to use a few items on a daily basis. My makeup consisted of black eyeliner, lip liner, and lip gloss from Estee Lauder or Clinique that my mom would buy for me. By the time high school rolled around, I added a beige shimmery eye shadow from Clinique and the occasional mascara. Until this point my love was tamed. Then came the love affair, when my senior year of high school my best friend and her older sister were MAC makeup artists. How could I not become obsessed with makeup? I became fascinated with their art! I would spend countless hours at the MAC counter, playing with color combinations and having my makeup done whenever I went over. From that point on my love has been growing with every new product, color, or look I see. My love is practically an obsession but at least it's a beautifully, creative one! What's your makeup love story? Disclaimer: This is not a sponsored post. The purpose of this post is to share an anecdote. All thoughts and opinions are my own. April 22nd is Earth Day which means it's time to bring some awareness to our planet and how being eco-friendly is important to all of us. I work on being eco-friendly as much as possible in all aspects of my life every day. Many people think that the little effort they make will not make a difference but it really does! So, make sure to do your part each and every day. For this reason, many beauty companies are more eco-friendly. Not only does it benefit our environment but also our health. It's great to see how many beauty companies out there are thinking of our environment while still providing great products. On that note, I was on Twitter today and had to share what I found on Zoya. 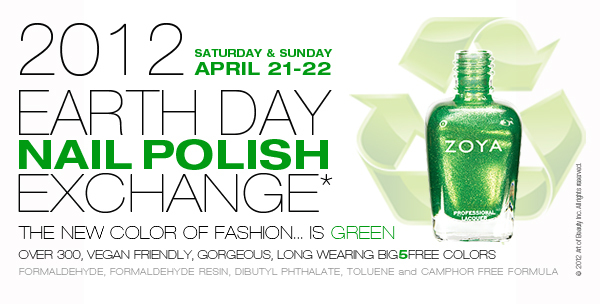 For Earth Day 2012, they're participating in a nail polish exchange program. Zoya nail polishes are the BIG5Free, which means they are Free of Toluene, Formaldehyde, Formaldehyde Resin, DBP, and Camphor. The way the exchange works is that you purchase new Zoya polishes at 50% off and then once you receive your new polishes you ship back your non eco-friendly polishes for Zoya to properly dispose of. How cool is that?! Click here to read Zoya's original posting on how the Earth Day Exchange works. Also, tell everyone you know so everyone has a chance to update their polishes and do something great at the same time. 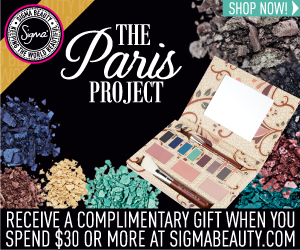 Do you know of any other beauty companies that have an Earth Day program or initiative? Disclaimer: This is not a sponsored post. The purpose of this post is to inform readers of a beauty product opportunity. Image is Zoya Nail Polish blog. All thoughts and opinions are my own.